The Boca Grande Sea Turtle Association wishes to extend its gratitude to the Woman’s Club for their generous support of our organization. 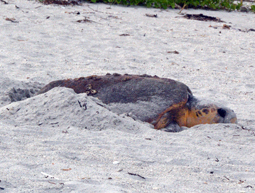 Since our inception, their generous grants have provided us with resources to protect and preserve sea turtles and their nesting habitat on Gasparilla Island through monitoring and educational outreach to the community. This year’s grant will help to broaden our successful “Junior Sea Turtle Patrol” initiative, which gives kids an unofficial role in keeping the beach clean and free from abandoned holes in the sand. The goal of the program is to help increase awareness of healthy beach practices at an earlier age and to harness the energy and enthusiasm kids have for sea turtles. The Woman’s Club’s support for this and other awareness-generating initiatives is very much appreciated as we gear up for another nesting season. Anyone who is interested in volunteering for the Turtle Patrol or in providing a donation can contract Melissa Csank at melcsank@gmail.com or through the BGSTA facebook page www.facebook.com/seaturtleawareness/.